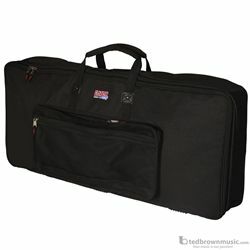 Gig Bag for 88 Note Keyboards with Reduced Depth. Heavy-duty rugged nylon construction with adjustable padded secure straps to hold keyboard in place during transport. Reinforced comfort riveted carry handles with exterior accessory pocket.